Meet Patrick! NBRAN is desperate need of a foster or preferably a serious foster-to-adopt for this sweet guy! If you know of anyone who has always wanted to help an "underdog," here is your chance. Patrick was in a Foster Home with other dogs for a short period of time before he had an altercation with a young pup at his Foster Home. Since then, NBRAN has moved Patrick to a kennel, where NBRAN Volunteer, Pat Amore, has been working with him. 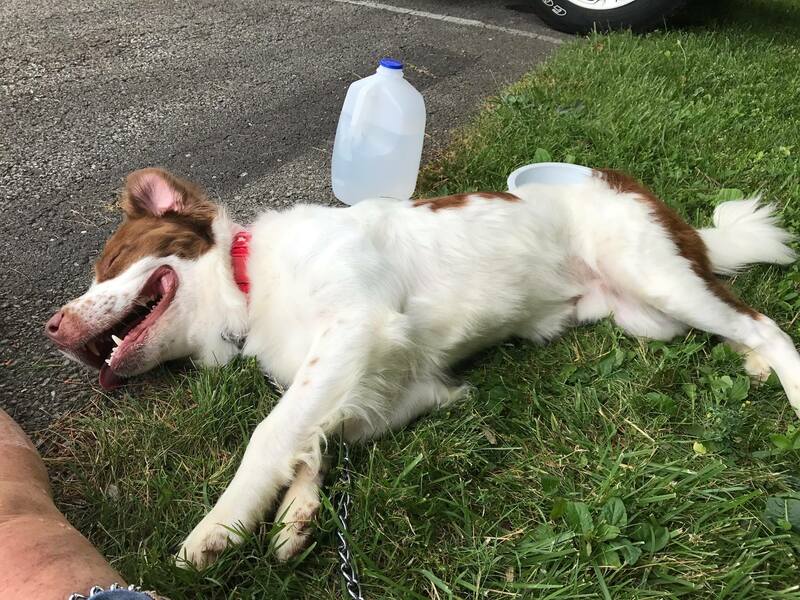 Patrick has an appointment this week (July 6) with a Behavioral Vet Specialist at OSU to help identify the source of this altercation; though most signs seem to point toward resource guarding. Patrick is a sweet guy, but strong. He does well on a leash in public parks. When confronted by an off leash dog, Patrick listened to Pat’s commands and doesn’t seemed phased by other dogs on a leash. What Patrick needs: a Forever Home with an experienced and strong owner. It would be easiest for Patrick to live in a home as an only dog and without small children. If you would love a companion who is as patient to wait for his McDonald’s as you are, we encourage you to read his whole story below. Patrick has been in foster care in a kennel in our area for two months due to an altercation he had with a young pup at his foster home. We are in the process of evaluating him and have an appointment at the OSU Behavioral Vet next week to see if can determine what may have triggered that behavior as he lived in the foster home for 4 weeks without event. He did play too rough off leash with the other dogs in the fenced yard, but did roam freely and interacted inside the house with the other dogs there. Food was involved and it was very possibly a resource guarding issue. I have worked personally with this boy the last several weeks at the kennel and taking him on walks in a nearby park. He has not shown any cage aggression or even on leash reactiveness to other dogs while at the kennel. An off leash dog ran up to us on a trail in the park and he was fine, stood at attention, observed my command to "leave it" until the owner came over and picked up his dog without event. We crossed other on leashed dogs on the trail giving proper space he was not reactive at all. Just based on his past, we think he would be more suitable for as an only dog but time will tell as we work with him and hopefully OSU can shed more light on that issue. If an experienced foster steps up, it will need to be someone who can separate from other dogs if necessary at this point. Some of his habits have been corrected with bitter apple spray, like him wanting to play tug of war with his leash. He now walks on his lead like a champ! He is VERY ball driven needs to be worked with about grabbing for things he wants, even if hands are in the way. I am working with him on that now and he is getting a little better. He is pretty strong, and has a strong mouth if he decides to get clamp on something. He has NEVER shown aggression to any human and is friendly to all people. Because he takes toys so rough, he is not suitable around small children. Please look through his pictures, he LOVES to ride in my truck and really relaxes after exercise! He waits patiently for his meal at McDonald's... We had a training session with Jennifer Mauger this week and she feels "there is a lot of dog to work with" and that some of Patrick's grabbing at things could possibly be resource guarding issues. He is very sweet and seems to really thrive on one-on-one attention. He loves to be touched and his former foster said he loved massages, and would enjoy those without end. He did seem to chase cats some at his foster home, so cats in the home is not a good option for him. My gut tells me he can be a SUPER companion to the right person, possibly someone who would just want a best friend and is willing to let him be an only dog. From my experiences thus far, I think that IF he has other dog issues, they can be worked with by keeping him on leash in public. Provided that the OSU feedback agrees with my perception of his adoptability, he will be available soon for adoption. NBRAN will need to have any potential adopters apply as both a volunteer and adopter since he will need to be place through NBRAN as a foster to adopt basis. If someone is willing to step up to foster only, we will consider that was well. We would like to place him locally but will consider moving him out of state if necessary to get him out of the kennel environment. The kennel and staff have been awesome in giving Patrick some extra attention and training, however the OSU behavioral vet has indicated that if we proceed with a behavioral modification program it will very hard to implement in a kennel environment. If we found someone who we can approve as a potential adopter or foster by his appointment Thursday July 6th, we would welcome them to join us at the visit if it was possible for them to attend. We REALLY need to get this guy in a home environment! If you have any questions, please reach out to me via email. PLEASE SHARE if you know of anyone who can help us with Patrick and THANK YOU for taking the time to read his story!